Narrow web label printing machine with compact design. 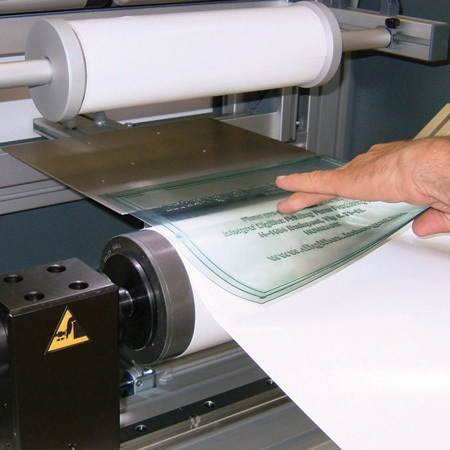 The Speedmounter Narrow works quickly and precisely for all label printing mounting projects. Frame built from German made MiniTec profile, precise linear rail systems, painted steel covers. Massive steel headstocks for supporting bore hole or shell type cylinders, shafted cylinders and / or sleeves. Large and comfortable working area for the operator between the optical system and the plate cylinder. 12” colour LED LCD displays with red colour crossline. The cross hairs are very thin. Suitable for mounting plates with microdots and/or register crosses. Focus of the optics can be adjusted by hand. Plate is lit by LED light under the optics. The camera carriages can be moved left and right by the knobs found on the upper machine frame. In case of the optional motorized optics the whole optics is covered by the upper frame. One of the main criteria of mounting is that the plates should have at least two register marks (microdots or crosses) across the plate that is found on all of the other plates (colours) on the same spot. The simple lead-on table contents only one piece of 280 mm long stainless steel covered guiding plate located inside of the machine which supports the printing plate during sticking onto the plate cylinder along the total width. Height and distance from the sleeve can be adjusted by up-down and forward-backward movement. 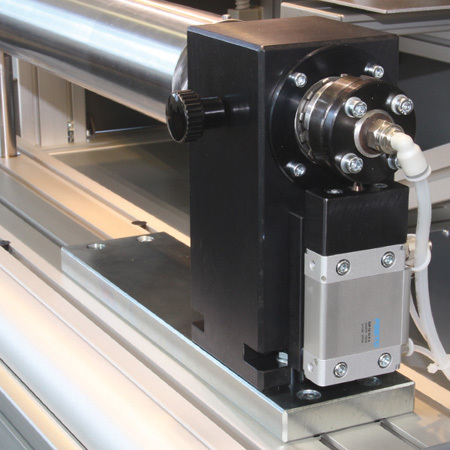 The ease height adjustment ensured by pneumatic power cylinder. Scale indicates appropriate height. 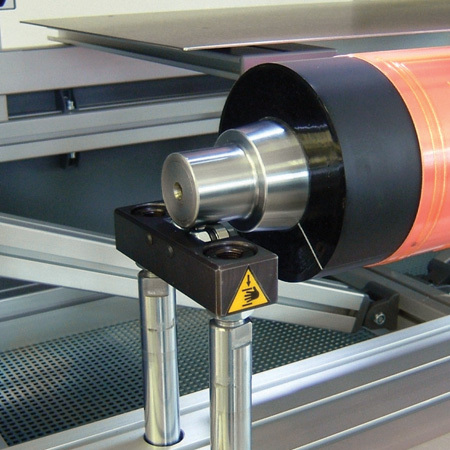 An integrated part of the lead-on table is the double side adhesive tape roll support device. 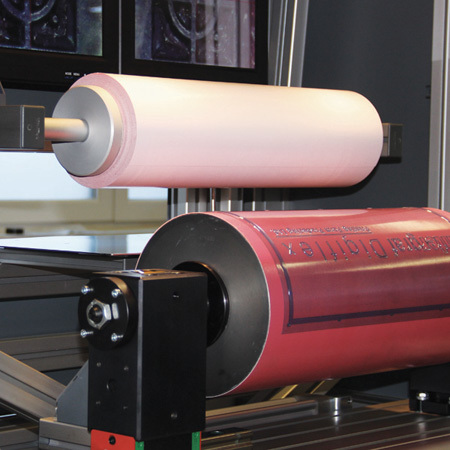 Aluminium roll covered in soft polyfoam matching the plate cylinder width. 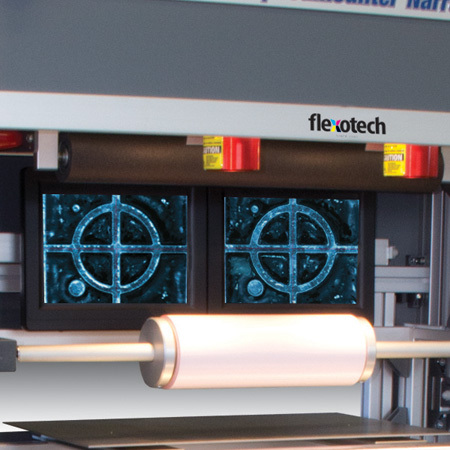 The lay-down roll has to be pulled out from the LCD displays and pushed back to the same place after usage. Due to the design of the unit it does not need fixing into position. 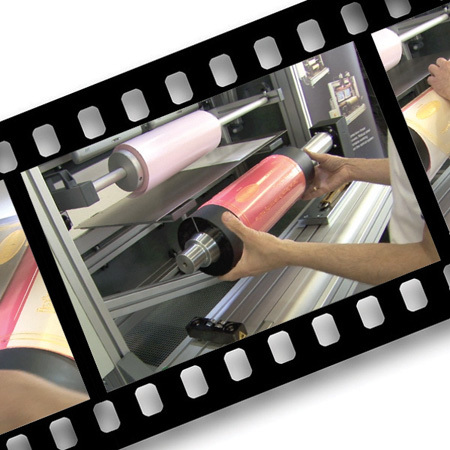 Usage of the lay-down roll ensures bubble and torsion free mounting of tapes and plates onto the cylinder. The double sided tape is supported by cone shaped adapters on each side. 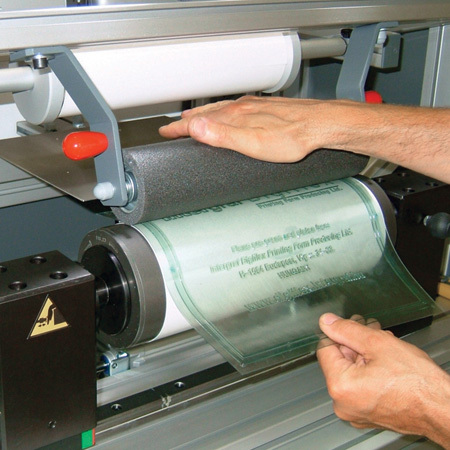 This ensures precise and user-friendly application of tape. In other words this ensures that the beginning and end of the tape meet precisely on the plate cylinder face. To change the tape just click the bar out of the support and the cone adapters can be loosened or fixed by 1 screw. Clamping of traditional borehole cylinders is secured by massive steel blocks. Left headstock unit is moved via a pneumatic air cylinder on the linear rail. Controlled by 2 foot pedals. The left foot pedal moves the headstock unit to left (opening) and the right foot pedal moves the unit to the right (closing). The movement of the headstock unit is controlled via a valve. The block is equipped with bearings and houses a shaft. The right side of the rotating shaft is cone shaped onto which different cylinder adapters can be placed. These cylinder adapters are changed fairly easily by removing a screw. The right headstock unit can be fixed in position for the mounting process manually with a handle to ensure that the cylinder does not turn. In addition to mounting borehole cylinders, mounting sleeves is also possible by inserted sleeve adapters. Clamping shell type print cylinders assembled with axle and discs is provided by specially shaped massive steel blocks. 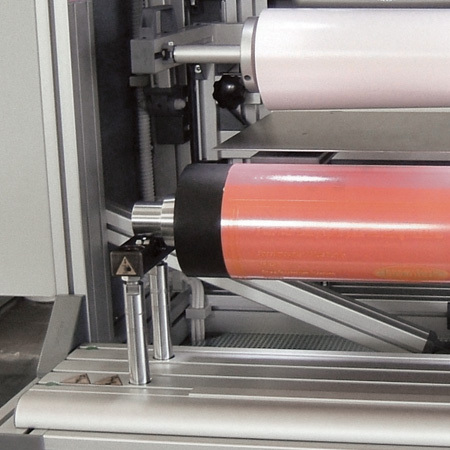 The QCD type mounting machine allows inserting shell type print cylinders into the machine without using any additional accessory. Inserting or removing the cylinders takes 2-3 seconds. 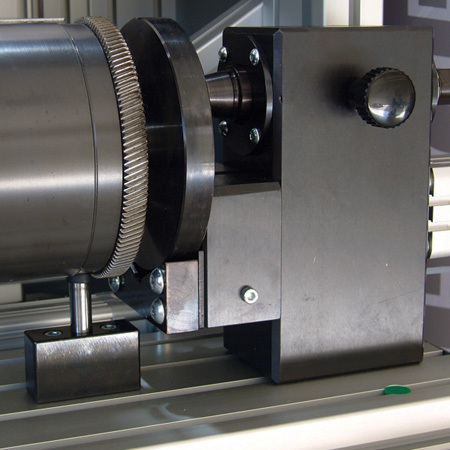 Clamping of a print cylinder and fixing its position in rotation direction is done by electro-pneumatic way. The machine is able to receive also traditional borehole print cylinders using the QCD type cylinder adapters. Mounting machine designed for elastic sleeves. Massive bearing house with built-in hard chrome plated air mandrel and precisely guided lift unit. Flow through type sleeves are useful on air mandrel. 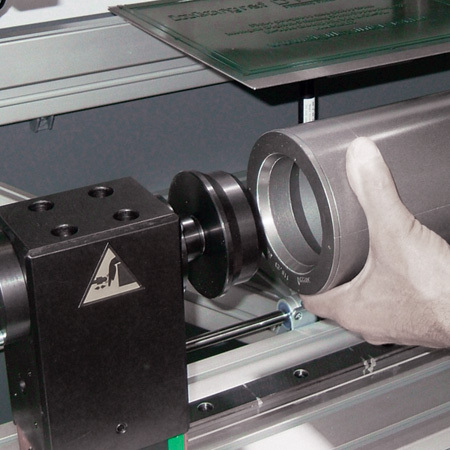 We recommend using sleeve type plate mounters for up to 600 mm wide sleeves with up to 600 mm repeat length. For wider cylinders or for repeats longer than aforementioned size, installation of our FALCON LIGHT model is recommended. The sleeve type Speedmounter Narrow is only available together with the aluminium stand, because the parts of the sleeve system are placed into the stand. Part of the equipment is the pneumatic break unit of the air mandrel. This break unit is part of the standard equipment. The fixing disk with the “V” profile groove is located on the shaft of the air mandrel. An electro-pneumatically operated pin fitted in the “V” groove keeps the mandrel stopped. The machine operator can activate the break in freely selected circumferential position as well. Aluminium profile frame with spray painted steel covers. Houses sleeve system and pneumatical fittings. With levelling pads and steel profiles to fix to the ground. 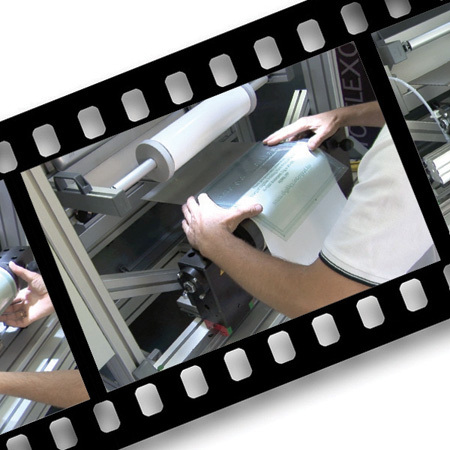 The storage shelf on the stand is suitable for keeping plates, tapes or other equipment used for the mounting process. Height of the stand is 900 mm. The steel profiles used for fixing the mounter to the bottom of the case must be used to fix the mounter to the ground to its final position. 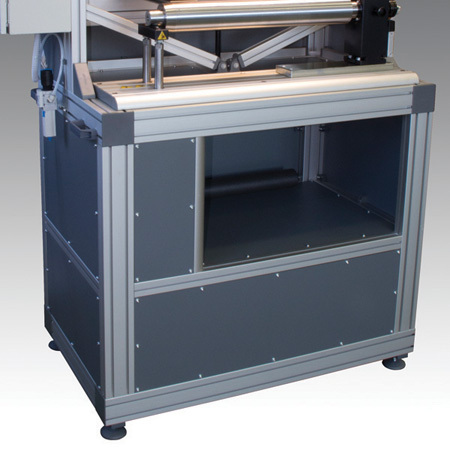 At sleeve type machines the aluminium stand is part of the standard equipment. 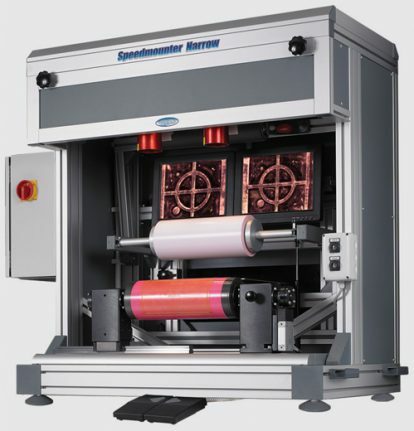 We will contact you soon concerning details about Speedmounter Narrow flexographic plate mounting machine. BORE HOLE DIAMETER OR BEARING NO. We will contact you soon concerning details about sleeve type Speedmounter Narrow flexographic plate mounting machine.